If you are an acupuncturist in New York and you are looking for CEU credits, please visit the NCCAOM CEU page for variety of Acupuncture CEU/PDA packages and individual courses to choose from. Demonstrate proficiency in English if they are a candidate whose application is based upon credit granted for the completion of courses of study in a country where English is not the main language spoken. Those seeking an Acupuncture license in the state of New York must also successfully complete the NCCAOM Acupuncture & Point Location exam and Foundations of Oriental Medicine exam. 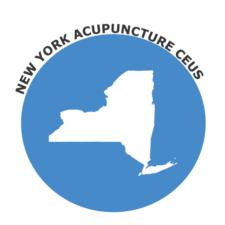 For more information about your acupuncture license, New York laws & rules, and other information regarding the profession, please visit http://www.op.nysed.gov/prof/acu/acupunlic.htm.